The California Public Employees' Retirement System (CalPERS) manages pension and health benefits for more than 1.6 million California public employees, retirees, and their families. Its pension plan assumes 7.5% annual growth. For fiscal year ending 2012 CalPERS Reports Preliminary Performance of 1 Percent. Bear in mind that CalPERS was massively underfunded before this report. How underfunded? CalPERS is both corrupt and incompetent. If it were a private firm, the lies about return on investments would send executives to jail and billions in lawsuits filed. “The California Public Employees’ Retirement System (CalPERS) is the biggest public pension in the country. It is also deeply underfunded. Depending on the measure used, they have just 55-75% of money needed for future expenses while 80% is considered the minimum to be safe. Their return is currently less than 99% of big pension funds. Now we know that CalPERS is in the lowest 1% of all pension funds—what else would you expect from a California government agency? Let's pretend that CalPERS is 100% funded. Already that is one hell of a pretend job, but assuming so, what will CalPERS underfunding look like at various compound plan performance rates? CalPERS currently has $233 billion in assets. CalPERS assumes 7.5% annual growth. 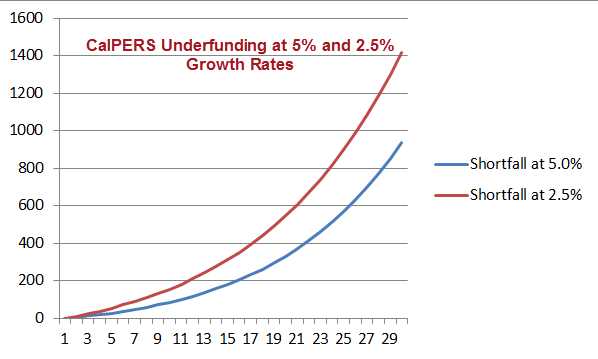 What if CalPERS only returns 5%? or 2.5%? 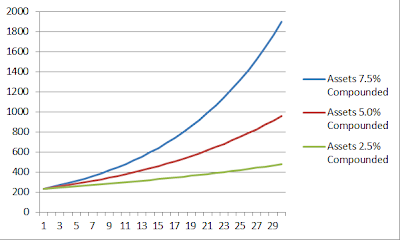 In the following charts the left scale is in billions of dollars. The bottom scale is in years. 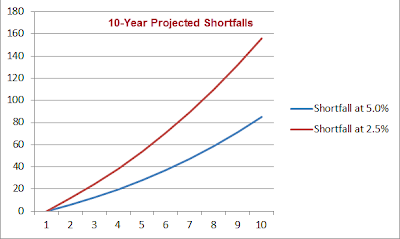 I believe annualized returns for the next 10 years will be between 0% and 5% at most. I highly doubt they will be as good as 5%. 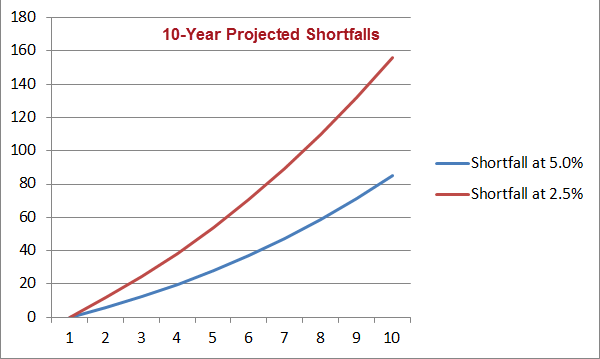 With that in mind, let's take a closer look at projections for the next 10 years. Once again the above charts assume pension plans are fully funded and they ignore effects of drawdowns if exceptionally low returns happen. Negative Returns for 10 Years? I have made the case that Negative Annualized Stock Market Returns for the Next 10 Years or Longer are Far More Likely Than You Think. Anatomy of Bubbles; Negative Returns for a Decade Revisited; Is Gold in a Bubble? Even if you assume negative or near-zero returns are impossible (ignoring Japan for the last 20 years and the S&P 500 since the 2000 peak) clearly low cumulative annual returns over extended periods are possible. Given boomer demographics, downsizing, student debt suppressing housing, etc., why shouldn't growth be anemic for quite some time? 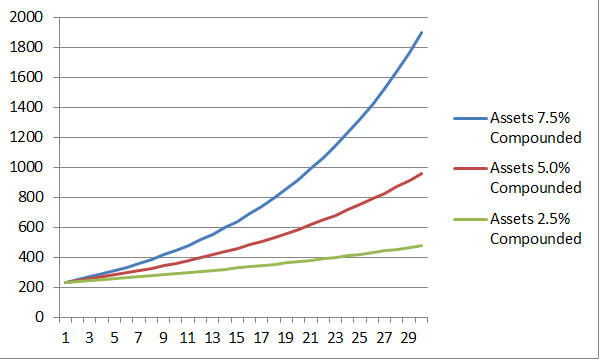 Given that pension plans are typically heavily invested in bonds, and the current 10-year treasury rate is 1.48%, it is going to be damn difficult (most likely impossible) for pension plans to come close to the annualized projection of 7.5% made by CalPERS and others. Furthermore, the more risk pension plans take attempting to meet near-impossible goals, the more likely it is that they will blow sky high in taking that risk. All things considered, especially with pension plan philosophy to be 100% invested in something 100% of the time, I believe pension plans will not avoid the next huge drawdown, with possibly devastating consequences. However, let's for the moment assume positive annual growth of 2.5% to 5%. Let's further assume plans are not currently underfunded. 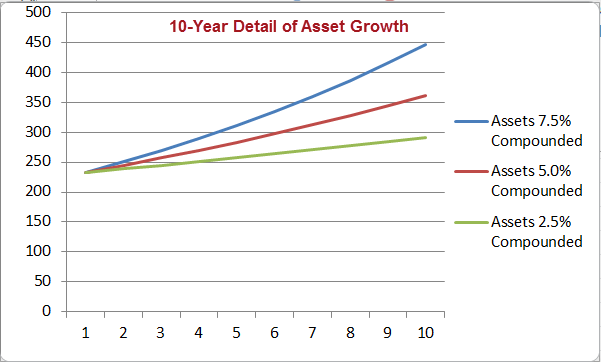 Finally, let's assume pension plans avoid the next big drawdown. Even with those optimistic assumptions (wildly optimistic as pertains to CalPERS being currently fully funded), CalPERS still rates to be deep in the hole 10 years from today. If that still does not shock you, hopefully the following YouTube video on Exponential Math will. 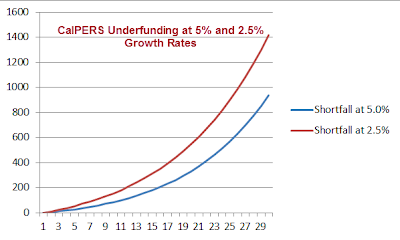 If you are not familiar with exponential functions such as 7.5% annualized growth assumed perpetually by CalPERS, please play the video above. Perhaps you should play it even if you are. Those in CalPERS counting on 7.5% annual growth are going to instead see clawbacks, reduced rates, or outright default.